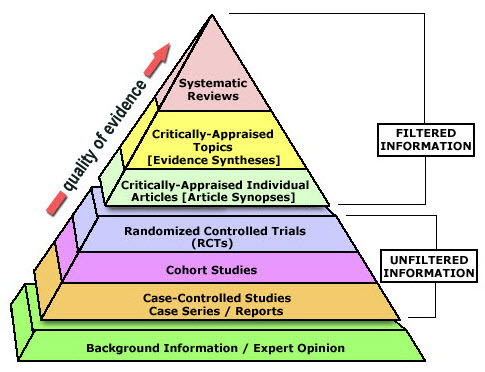 One way to organize the different types of evidence involved in evidence-based practice research is the levels of evidence pyramid. The pyramid includes a variety of evidence types and levels. The levels of evidence pyramid provides a way to visualize both the quality of evidence and the amount of evidence available. For example, systematic reviews are at the top of the pyramid, meaning they are both the highest level of evidence and the least common. As you go down the pyramid, the amount of evidence will increase as the quality of the evidence decreases. EBM Pyramid and EBM Page Generator, copyright 2006 Trustees of Dartmouth College and Yale University. All Rights Reserved. Produced by Jan Glover, David Izzo, Karen Odato and Lei Wang. Scroll down the page to the Systematic reviews, Critically-appraised topics, and Critically-appraised individual articles sections for links to resources where you can find each of these types of filtered information. Authors of a systematic review ask a specific clinical question, perform a comprehensive literature review, eliminate the poorly done studies, and attempt to make practice recommendations based on the well-done studies. Systematic reviews include only experimental, or quantitative, studies, and often include only randomized controlled trials. Cochrane systematic reviews are considered the gold standard for systematic reviews. This database contains both systematic reviews and review protocols. To find only systematic reviews, select Cochrane Reviews in the Document Type box. This database includes systematic reviews, evidence summaries, and best practice information sheets. To find only systematic reviews, click on Limits and then select Systematic Reviews in the Publication Types box. To see how to use the limit and find full text, please see our Joanna Briggs Institute Search Help page. DARE contains reviews and details about systematic reviews on topics for which a Cochrane review may not exist. Note: It does not contain full-text systematic reviews, it only has abstracts. This database is recommended for long-term research projects, not for retrieving full-text systematic reviews. To find systematic reviews in CINAHL, select Systematic Review in the Publication Type box. Authors of critically-appraised topics evaluate and synthesize multiple research studies. Critically-appraised topics are like short systematic reviews focused on a particular topic. This collection offers comprehensive, timely collections of critical reviews written by leading scientists. To find reviews on your topic, use the search box in the upper-right corner. This free database offers quick-reference guideline summaries organized by a new non-profit initiative which will aim to fill the gap left by the sudden closure of AHRQ’s National Guideline Clearinghouse (NGC). To find critically-appraised topics in JBI, click on Limits and then select Evidence Summaries from the Publication Types box. To see how to use the limit and find full text, please see our Joanna Briggs Institute Search Help page. Best Evidence Topics are modified critically-appraised topics designed specifically for emergency medicine. Authors of critically-appraised individual articles evaluate and synopsize individual research studies. Quality articles from over 120 clinical journals are selected by research staff and then rated for clinical relevance and interest by an international group of physicians. Note: You must create a free account to search EvidenceAlerts. This journal publishes reviews of research on the care of adults and adolescents. You can either browse this journal or use the Search within this publication feature. This journal reviews research studies that are relevant to best nursing practice. You can either browse individual issues or use the search box in the upper-right corner. You may not always be able to find information on your topic in the filtered literature. When this happens, you'll need to search the primary or unfiltered literature. Keep in mind that with unfiltered resources, you take on the role of reviewing what you find to make sure it is valid and reliable. Note: You can also find systematic reviews and other filtered resources in these unfiltered databases. The CINAHL Plus with full text database is a great place to search for different study types. To learn how to use limiters to find specific study types, please see our CINAHL Search Help page. The MEDLINE with Full Text database has a more medical focus than CINAHL. We recommend starting your searches in CINAHL and if you can't find what you need, then search MEDLINE. To learn how to use limiters to find specific study types, please see our MEDLINE Search Help page. Background information and expert opinions are not necessarily backed by research studies. They include point-of-care resources, textbooks, conference proceedings, etc. Provide the ideal answers to clinical questions using a structured search, critical appraisal, authoritative recommendations, clinical perspective, and rigorous peer review. Clinical Inquiries deliver best evidence for point-of-care use. Harrison, T. R., & Fauci, A. S. (2009). Harrison's Manual of Medicine. New York: McGraw-Hill Professional. Contains the clinical portions of Harrison's Principles of Internal Medicine. Lippincott manual of nursing practice (8th ed.). (2006). Philadelphia, PA: Lippincott Williams & Wilkins. Provides background information on clinical nursing practice. An open-access, point-of-care medical reference that includes clinical information from top physicians and pharmacists in the United States and worldwide. An open-access repository that contains works by nurses and is sponsored by Sigma Theta Tau International, the Honor Society of Nursing. Note: This resource contains both expert opinion and evidence-based practice articles. You may hear about a resource called the TRIP database. This is a clinical, evidence-based research search engine anyone can access on the Internet. The TRIP database searches both filtered and unfiltered resources. It can sometimes link you into full-text content, but there is no full text available within TRIP itself. Because it can be difficult to get to the full text, TRIP is not recommended for assignments related to finding specific types of evidence-based research. It also may not have many results for a specific evidence level on every topic. You may want to explore and familiarize yourself with this online search engine even if you use the Walden Library databases for your scholarly research. It is important to know about TRIP since it is a valuable online search engine for practitioners and clinicians, particularly if they do not have access to the same databases we provide in the Walden Library.